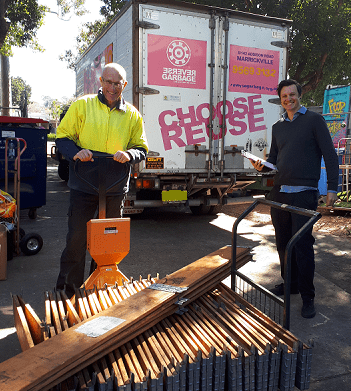 Always developing and researching new ways to increase the reuse of materials and decrease the amount of valuable resources heading to landfill, Reverse Garbage is set to launch a new reuse social enterprise – ‘ReConsidered’ – an exciting shopfront space located in the heart of Redfern. Some of these rare finds have also been lovingly restored or upcycled by Reverse Garbage’s ReStore and ReCreate Team – a creative collective of staff artists, educators and designers committed to the organisation’s mission to practice reuse and work exclusively with only reuse materials. In addition, ReConsidered will devote a space in its shop for a monthly exhibit of artworks and art installations made by local Artists to promote their work and the use of reuse materials to create art. ReConsidered will open its doors on Thursday 10 April at 167 Regent Street, Redfern. Hours of operation are Wednesdays to Sundays, 11am to 6pm. Closed Mondays and Tuesdays. ReConsidered will officially open its doors 11am, Thursday 10 April 2014. An official launch celebration will take place from 6pm to 9pm with special guests, entertainment and canapés. All welcome! For media enquiries and interviews please contact Mark Bond, Reverse Garbage Marketing Manager on 02 9569 3132.